Even though Valentine’s Day is traditionally a holiday for lovers, it’s not always possible to sneak away, especially if you have small children. However, there’s no reason why Valentine’s Day can’t be turned into a family affair. After all, it’s really about celebrating love in all its forms, including the love between a parent and a child. There are a number of fun, family-friendly activities you, your spouse and your children will enjoy doing together to mark the season of love. Any holiday is a great excuse to start baking, and Valentine’s Day is no different. Decide on a treat that’s not too difficult to make, which will depend on the age of your kids. Toddlers will most likely just want to lick the bowl afterwards, but they can help decorate cookies or get some of the ingredients out. Older kids can help beat eggs and mix everything together in a bowl. Heart-shaped cookies and brownies are classic choices, but pink and red frosted cupcakes are a fun idea too. If you are really feeling adventurous, you can try making your own chocolates using a mold. Store-bought molds come in all shapes and sizes, but if you want something more customized you can make your own mold out of brown sugar, cornstarch and powdered sugar. Giving Valentine’s cards to a sweetheart is a longstanding tradition. However, there is no reason why your family can’t write love notes to one another. 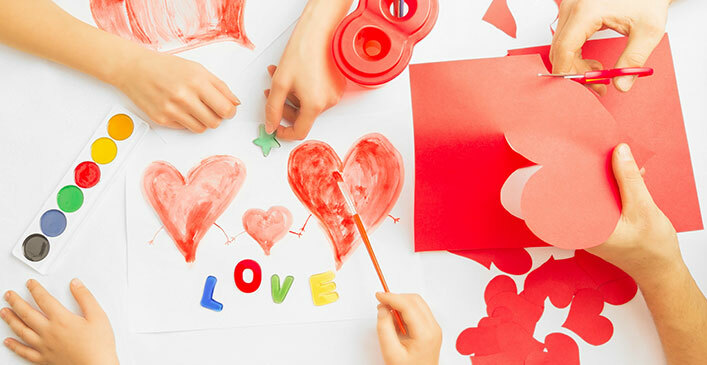 The kids can craft their own Valentines out of construction paper, paper doilies and glitter. Older kids and teens can also design theirs on the computer. Alternately, everyone can cut out small hearts, write something they love about a family member, and then give it to them! Love notes make everyone feel special and are a fun activity to do as a family. Dinner and a movie is a classic date night idea that’s easily family-friendly when done at home. You can throw together your family’s favorite dish or something relatively easy like Italian food. If you feel like splurging a bit, order delivery and enjoy someone else doing the work. You can light some candles and set a warm, cozy ambiance in the living room. Then, have everyone plop down in front of the TV and watch a kid appropriate love-themed movie. Lady and the Tramp, Shrek, The Princess Bride and Beauty and the Beast are top picks and fun for all ages. Sharing your love of the outdoors with your kids is another great Valentine’s Day activity. The whole family can hike a trail at a nature center or local park and enjoy the beauty of nature together. During your hike the kids can have a scavenger hunt of sorts; have them look for heart-shaped items like rocks, leaves and flower petals. You can also make a heart-shaped rock formation, which is sure to bring a smile to all who come across it. Some wilderness parks may even have wildlife hikes or tours, which is perfect for your little animal lovers. Make a Love-Themed Playlist and Dance! Love songs are such an essential part of our culture. Why not put together a playlist of G-rated love songs for the family to enjoy together. Early Beatles songs like “Love Me Do,” “I Wanna Hold Your Hand” and “Do You Love Me” are all great choices. Definitely choose some classics to educate your children about music, but there are tons of modern songs to choose from as well. Add some pop songs from former Disney stars like Selena Gomez, Demi Lovato and Miley Cyrus as Hannah Montana. Many of their songs are upbeat and promote self-love and confidence. Everyone can learn the lyrics and sing them together. Whatever you choose, just make sure it’s danceable too! Whatever activities you end up doing for Valentine’s Day, make sure everyone is involved. Pick something special that could even become a holiday tradition in your home. As you do the activity, remind your family how much you love them and have them do the same. The important thing is that you are all together spending time with one another. Some families don’t have that luxury so be grateful and relish how lucky you are.